" I am glad I found this site. It is user friendly and has great variety of 'safe' products." Capt. Caleb Holt lives by the old firefighter's adage: Never leave your partner behind. Inside burning buildings, it's his natural instinct. In the cooling embers of his marriage, it's another story. After seven years of marriage, Caleb and Catherine Holt have drifted so far apart that they are ready to move on without each other. Yet as they prepare to enter divorce proceedings, Caleb's dad asks his son to try an experiment, The Love Dare. While hoping The Love Dare has nothing to do with his parents' newfound faith, Caleb commits to the challenge. But can he attempt to love his wife while avoiding God's love for him? Will he be able to demonstrate love over and over again to a person that's no longer receptive to his love? Or is this just another marriage destined to go up in smoke? 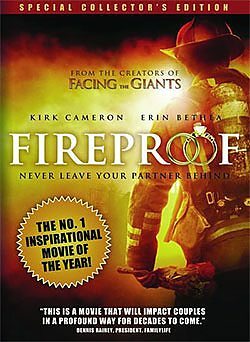 Fireproof is the third feature film from Sherwood Pictures and the Kendrick Brothers—the creators of Facing The Giants & Flywheel. With hope-filled storytelling, the moviemaking ministry of Sherwood Baptist Church continues touching the world from Albany, Georgia. Casting Crown’s hit music video: "Slow Fade"
Format: DVD Region 1 - Widescreen What's a Region Code? The 40 daily dares from The Love Dare book. Get the first 3 feature films from Sherwood Pictures and the creators, the Kendrick Brothers. Inside burning buildings, Captain Caleb Holt lives by the firefighter's adage: Never leave your partner. Never leave your partner behind! This study is founded on Biblical principles for strong, God-centered, lifelong marriages. The Fireproof Your Marriage Participant's Guide is founded on Biblical principles for strong, God-centered, marriages. really enjoyed this one, 2nd time seeing it, loved it even more this time. This movie would be great to show to married couples who know that they need help in coping with their marriages. This was well done, and it even made me cry in spots. Our youth group watched this movie tonight. Although it deals with marriage, the message about patience, kindness and love being a choice was great for young adults as well. This is a good movie. I thought this movie was well done and liked how they put some humor in it too.